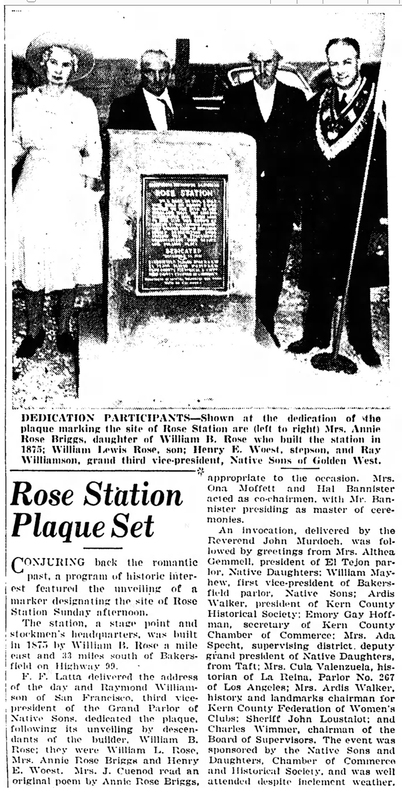 SCVHistory.com JK4101 | Tejon Ranch | Dedication of Rose Station Plaque, 11-16-1941. 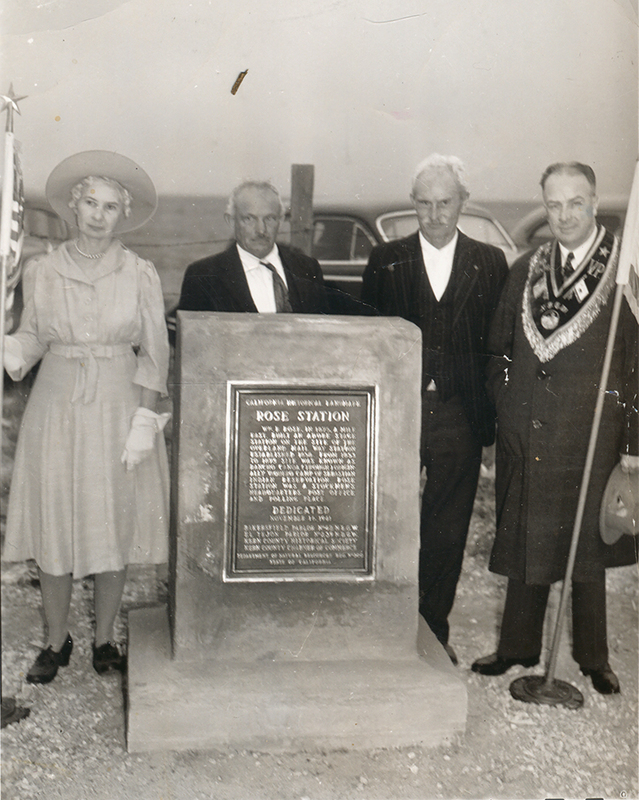 November 16, 1941 — From left: Annie Rose Briggs, William Lewis Rose, Henry E. Woest and Ray Williamson at the dedication of a plaque commemorating Rose Station, which was started in 1875 by William B. Rose at the bottom of the Grapevine grade in the present town of Grapevine on the Tejon Ranch. Annie and William L. (alias Billy, who shot William Jenkins in 1916) are children of William B. Rose; Henry Woest was his stepson (Annie and William L.'s half-brother from their mother's previous marriage). Williamson was the representative of the Grand Parlor of Native Sons of the Golden West at the dedication. Published in the Bakersfield Californian on Nov. 17, 1941 (see below), this photograph was among the effects of Annie Rose Briggs (1883-1972) at the time of her death and was left to her friend Glenn McKinney of Newhall. It comes to us from McKinney's daughter, Kathy McKinney Baxter (Hart High Class of 1971), and her husband, Jim Baxter (Hart Class of 1969). William B. 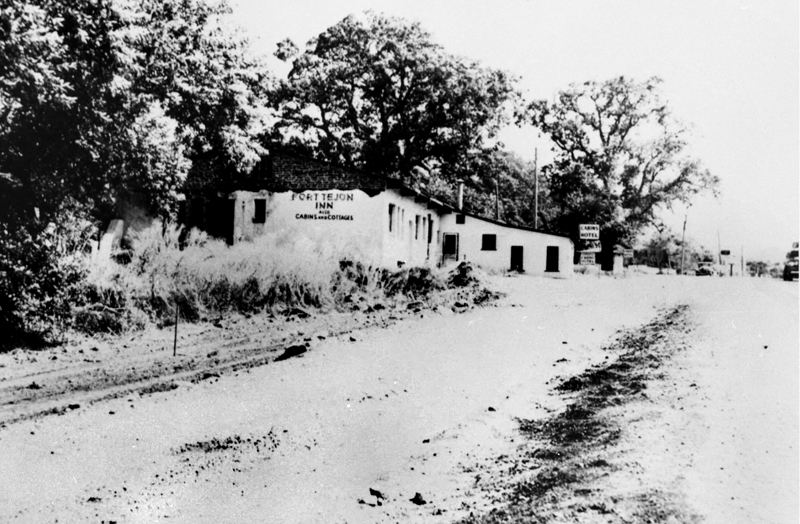 Rose built his station on the site of a former Overland Mail station. José Jesús Lopez, Gen. Edward Beale's majordomo (foreman) at Tejon Ranch, was an early partner, but Lopez told historian Frank Latta (Latta 1976) that he backed out within a year because of a dispute over the operation of the business. 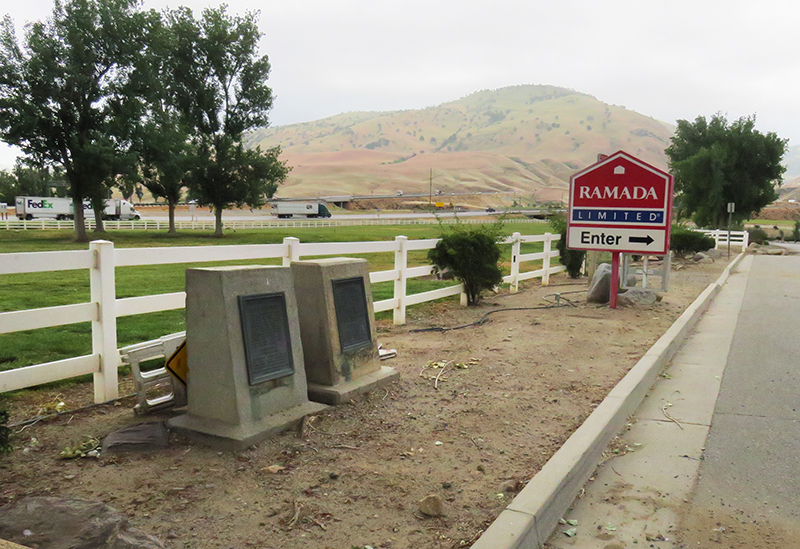 Rose eventually gave up on it, too, and moved down to Castaic where he homesteaded land. From 1853 to 1875 this site, originally a vaquero camp of the Sebastian Indian Reservation, was known as Rancho Canoa (trough). In 1875, Wm. B. 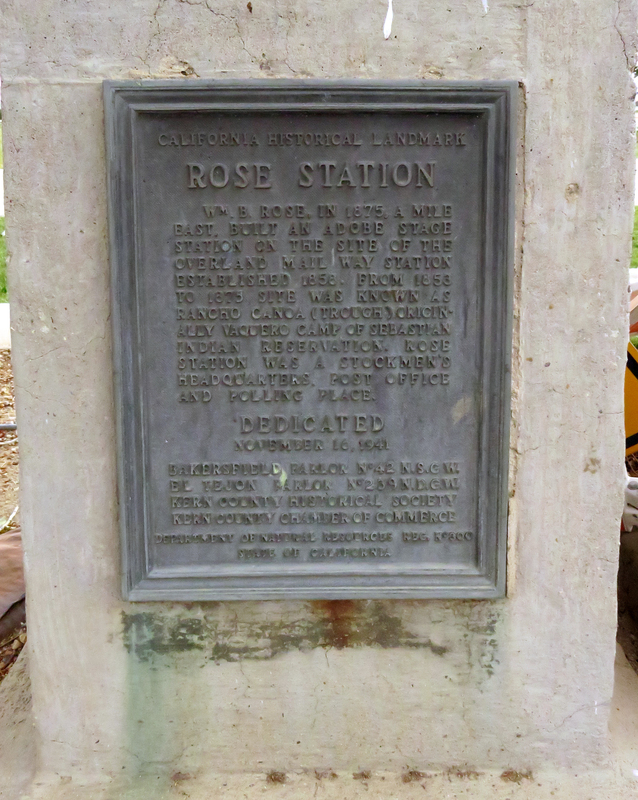 Rose built an adobe stage station on the site of the Overland Mail way station established 1858. Rose Station was a stockmen's headquarters, post office, and polling place. Wm. B. Rose, in 1875, a mile east, built an adobe state station on the site of the Overland Mail way station established 1858. From 1858 to 1875 site was known as Rancho Canoa (trough) originally vaquero camp of Sebastian Indian Reservation. Rose Station was a stockmen's headquarters, post office and polling place. 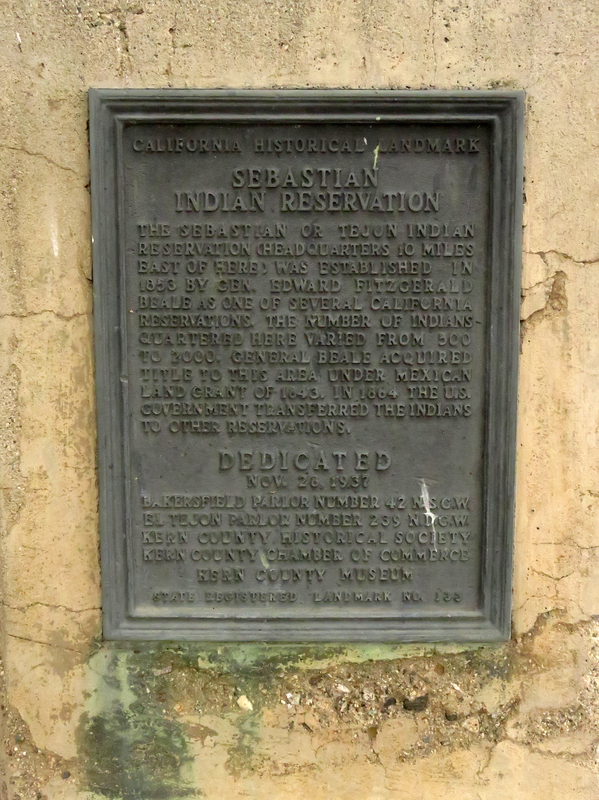 The Sebastian or Tejon Indian Reservation headquarters 10 miles east of here was established in 1853 by Gen. Edward Fitzgerald Beale as one of several California reservations. The number of Indians quartered here varied from 500 to 2,000. General Beale acquired title to the area under Mexican land grant of 1843. In 1864 the U.S. government transferred the Indians to other reservations. Not exactly. Government emissaries negotiated 18 treaties with indigenous people up and down California in 1851-52, but the U.S. Senate never ratified them. 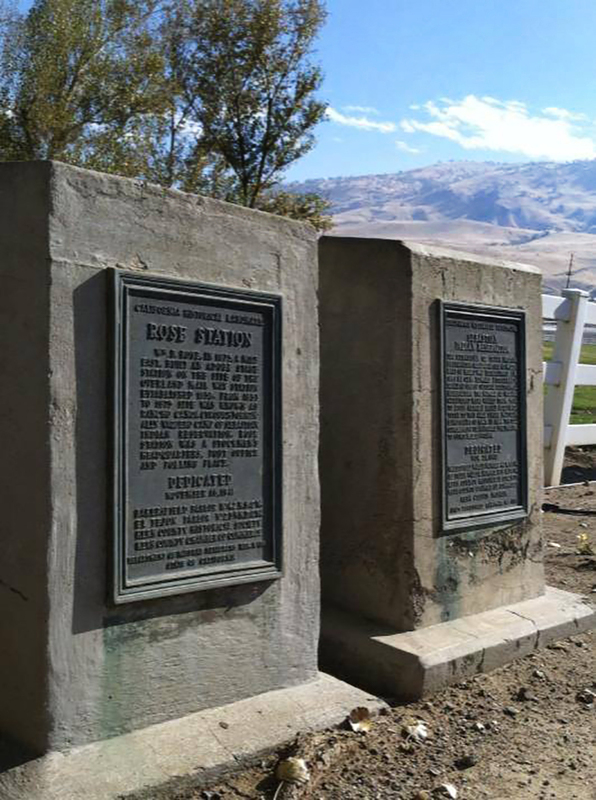 The only one that more-or-less came to fruition was the short-lived (San) Sebastian Indian Reservation, with Fort Tejon established at the same time to keep an eye on it. Native peoples were brought to the reservation from as far away as the Owens Valley, a distance of some 200 miles. (Other, much smaller, reservations in California, like those in the Owens Valley, came considerably later.) When Fort Tejon was abandoned in 1864, the reservation dissolved with it. The people, now landless, were left to fend for themselves. Many stayed on as laborers on the Tejon Ranch — still under Beale's control because now, as of 1865, he was the landowner. (Beale assigned José Jesús Lopez, a descendant of Spanish colonists, to manage them.) 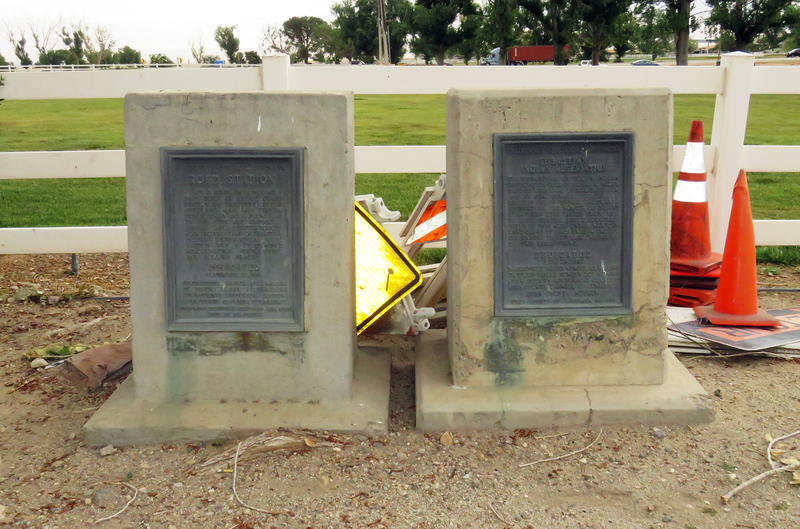 Members of the modern Tejon Indian Tribe descend from people living at the reservation; Tataviam people from the present-day Newhall area were brought there, as well, including one who became the captain (indigenous leader) at the reservation. Bakersfield Californian | Monday, November 17, 1941. Conjuring back the romantic past, a program of historic interest featured the unveiling of a marker designating the site of Rose Station Sunday afternoon. The station, a stage point and stockmen's headquarters, was built in 1875 by William B. Rose a mile east and 33 miles south of Bakersfield on Highway 99. F.F. Latta delivered the address of the day and Raymond Williamson of San Francisco, third vice-president of the Grand Parlor of Native Sons, dedicated the plaque, following its unveiling by descendants of the builder, William B. Rose; they were Mrs. Annie Rose Briggs and Henry E. Woest. Mrs. J. Cuenod read an original poem by Annie Rose Briggs, appropriate to the occasion. Mrs. Ona Moffett and Hal Bannister acted as co-chairmen, with Mr. Bannister presiding as master of ceremonies. An invocation, delivered by the Reverend John Murdoch, was followed by greetings from Mrs. Althea Gemmell, president of El Tejon parlor, Native Daughters; William Mayhew, first vice-president of Bakersfield parlor, Native Sons; Ardis Walker, president of Kern County Historical Society; Emory Gay Hoffman, secretary of Kern County Chamber of Commerce; Mrs. Ada Specht, supervising district, deputy grand president of Native Daughters, from Taft; Mrs. Cula Valenzuela, historian of La Reina, Parlor No. 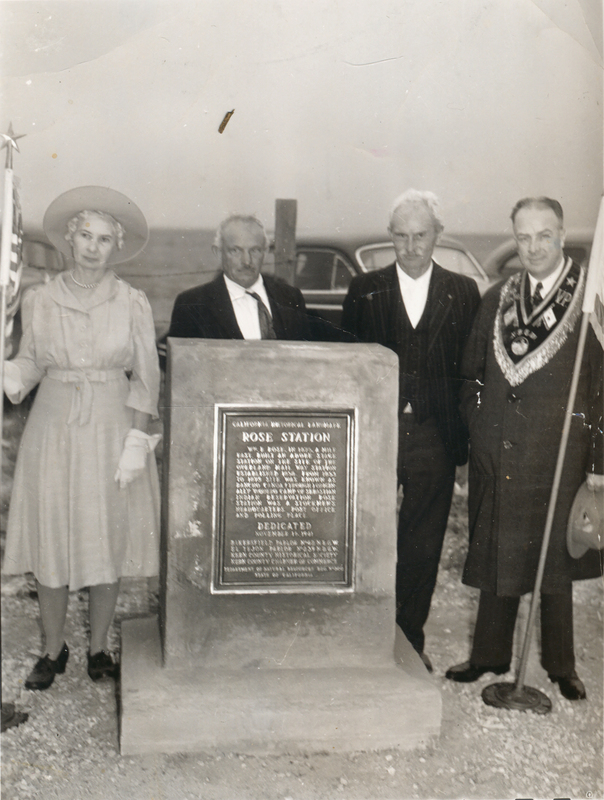 267 of Los Angeles; Mrs. Adris Walker, history and landmarks chairman for Kern County Federation of Women's Clubs; Sheriff John Loustalot; and Charles Wimmer, chairman of the Board of Supervisors. The event was sponsored by the Native Sons and Daughters, Chamber of Commerce and Historical Society, and was well attended despite inclement weather. 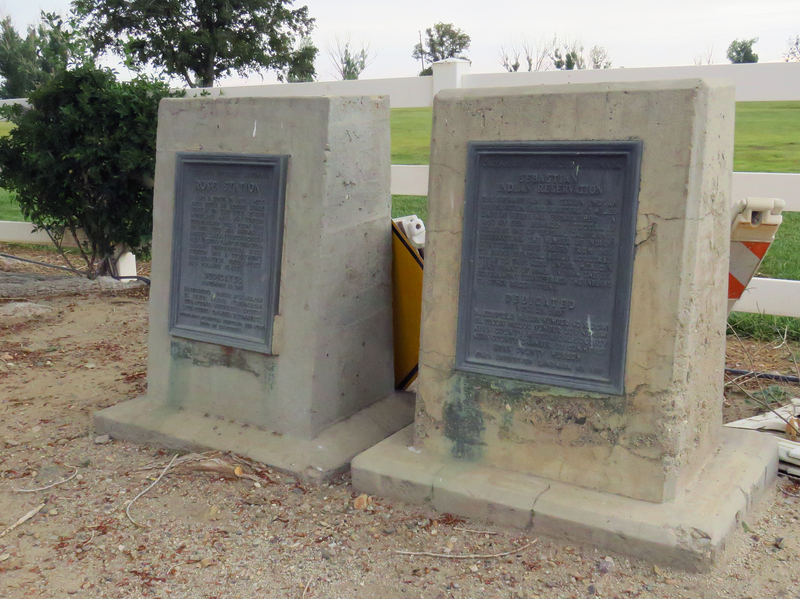 Rose Station and Sebastian Indian Reservation plaques, N34.941383 W118.932583. Photos by Leon Worden, 5-6-2017. Above: Photo by James Snead, 2013. JK4101: 9600 dpi jpeg. Online image only.